Nyanog Adem is a 32-year-old mother of six. She comes from Ariath village, north of Aweil in Northern Bahr el Ghazal state, South Sudan. She trekked 15 kilometres to the only place she thought she would get help - the MSF health centre in Majangkar, Pamat. Her fourth son, Akwe Nyanog, had been ill for a week but in the two days prior to his admission to the health centre his condition had worsened, with high fever and general body weakness and fatigue. So, together with her youngest son, too young to be left at home, she left to seek medical help. When asked about other health centres close to her village, she remarks: “Only this MSF medical facility is the solution. Each time my children are sick, I rush them here. This is the only accessible, good facility I rely on. On her way, she stops over to ask for water to quench her thirst and that of her children before embarking on her essential journey. Unfortunately, Akwe was diagnosed with both malaria and malnutrition, and had to be admitted to undergo treatment at the centre. Whenever her children fall sick, Nyanog has to make this 15 kilometre journey on foot to Majangkar health centre as she cannot afford the high cost of travel. 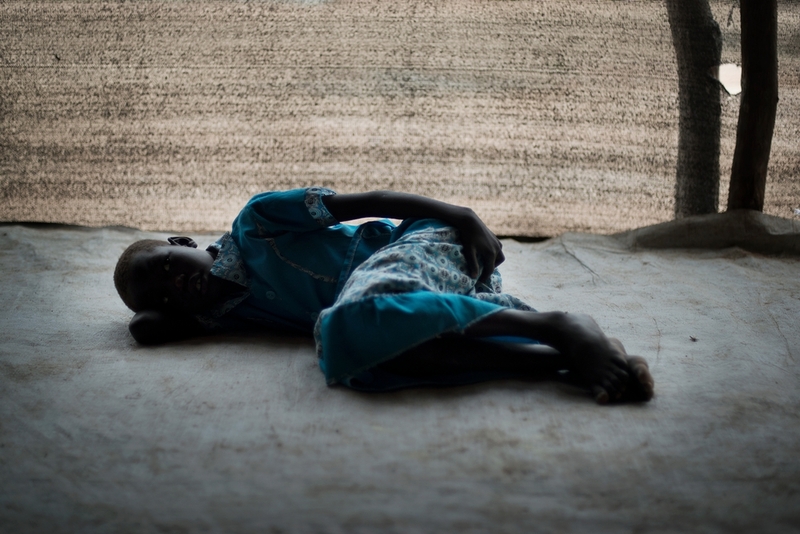 A young patient waits for malaria treatment at an MSF centre in Pamat. “I have no money to pay for transport or buy food. Nor do I have animals to provide my children with milk and food. "I’m a cultivator, but the rains have affected the last season’s crop; we need food, water-boreholes, schools for our children. It is very bad here, many basic needs are lacking,” Nyanog explains. “It’s very discouraging to receive people who are very sick. They are sick with diseases we can treat, but they come in terminal stages, and we have lost lives,” says Denis Oyori, MSF’s head of nursing activities in Pamat, Northern Bahr el Ghazal. Malaria is endemic in many parts of South Sudan and many people die during the rainy season, when malaria cases increase due to the raised temperatures. Crucially, those in the outer regions of the country suffer greatly as they can neither access malaria treatment due to the distance to main town hospitals, nor can they afford malaria medicine. Like Nyanog, many people in remote areas of South Sudan have been cut off from health services. Antimalarial drugs do not reach them and their families especially during the rainy season, when malaria infection is rampant.